Rishabh Nagendra is a graduate of the Rimsky-Korsakov St. Petersburg State Conservatory in Russia. He has studied under pedagogues with deep ties to the rich and revered musical traditions of Russia’s cultural capital – the piano under Semyon Denisov, chamber music with Natalia Arzumanova, composition with Sergei Slonimsky and harpsichord performance with Elena Seredinskaya. He has performed solo piano music, chamber music, vocal music (as an accompanist), and his own compositions on several occasions in Russia and India. 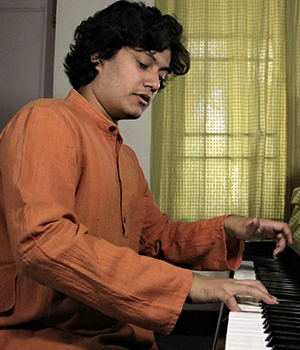 Rishabh began his piano studies in Chennai, at the age of 6. After formal schooling, he dedicated a year exclusively to private piano lessons with Dr Jan Brouwer in Mysore, followed by a challenging six-year course in piano performance and pedagogy in St. Petersburg. Rishabh encourages his students to develop independent, critical musical thinking and a professional approach. He hopes to cultivate in them an all-round interest in music – melding instrumental practice with theory, aural training, and history. He strives to balance the passion and love for music that are responsible for kindling the musical fire within one’s heart, with the restraint and discipline so critical to its sustained growth.